Unemployment in the former East Germany remains double what it is in the west, and in some regions the number of women between the ages of 20 and 30 has dropped by more than 30 percent. In all, roughly 1.7 million people have left the former East Germany since the fall of the Berlin Wall, around 12 percent of the population, a continuing process even in the few years before the economic crisis began to bite. And the population decline is about to get much worse, as a result of a demographic time bomb known by the innocuous-sounding name “the kink,” which followed the end of Communism. The birth rate collapsed in the former East Germany in those early, uncertain years so completely that the drop is comparable only to times of war, according to Reiner Klingholz, director of the Berlin Institute for Population and Development. “For a number of years East Germans just stopped having children,” Dr. Klingholz said. The newspaper Frankfurter Allgemeine Zeitung reported recently that although 14,000 young people would earn their high school diplomas this year in Saxony, only 7,500 would do so next year. Since 1989, about 2,000 schools have closed across the former East Germany because of a scarcity of children. Now this situation is quite serious, and needs a long term solution, but it is not as serious as what is currently happening to Latvia, or Bulgaria, or a number of the other former communist states. Unless, of course, the lesson Angela would like to draw our attention to is that East Germany managed to salvage something from what would otherwise be population wreckage by sneaking in under the shelter of another state, with a centralized system of support for pensions and health care. Somehow I doubt it, but perhaps this is what we need to think more about. The EU needs a pan European health and pension system, to distribute the burden equitably. This is the conclusion I reached during my last visit to Riga. It isn’t just a Euro related issue, it is to do with having a unified labour market, with people able to move to where the jobs exist, and the pay is better. For years people complained about the absence of labour mobility in the EU. Now we have it, the flaw in the institutional infrastructure is obvious. Young people are moving from the weak economies on the periphery to the comparatively stronger ones in the core, or out of an ever older EU altogether. This has the simple consequence that the deficit issues in the core are reduced, while those on the periphery only get worse as health and pension systems become ever less affordable. Meanwhile, more and more young people follow the lead of Gerard Depardieu and look for somewhere where there isn’t such a high fiscal burden, preferably where the elderly dependency ratio isn’t shooting up so fast. I am sufficiently concerned about this issue, which I think ultimately endangers possibilities of economic recovery all along the periphery, to have created a dedicated facebook page, campaigning for one single issue – that the EU Commission and the IMF give a greater priority to trying to measure these flows, and understand their consequences. I am simply asking that they pressure EU member states to improve their statistics gathering, treat the issue as a priority, and identify an indicator to incorporate in the Macroeconomic Imbalance Procedure (MIP) Scoreboard. Really it doesn’t matter whether you are in favour of austerity, or against it, feel more Keynesian than Austrian, or vice verse, all I am asking for is that this problem be taken more seriously, measured and studied. Really there has been a before and after to the financial crisis, at least insofar as awareness of the demographic dimension is concerned. Really, before the onset of the crisis very few people really attached much importance to the question. Since the arrival of the European sovereign debt crisis, and the fiscal cliff debate in the United States, awareness has grown that population ageing probably will slow economic growth, and that previous expectations about levels of pension and health care provision may have been way too optimistic. The latest example of this has been Nobel Laureate Paul’s Krugman’s comments on how Japan’s demographics may be influencing its growth rate. In a tellingly graphic expression he explains that the root of Japan’s ailment might be that the country is suffering from a growing “shortage of Japanese”. Once you realise that population shortage may be a problem in Japan, you start wondering where else it might be one. And then, once you begin to look you start seeing the issue springing up like mushrooms all over the place. In Bulgaria for example. According to the 2011 census, Bulgaria has lost no less than 582,000 people over the last ten years. In a country of 7.3 million inhabitants this is a big deal. Further, it has lost a total of 1.5 million of its population since 1985, a record in depopulation not just for the EU, but also by global standards. The country, which had a population of almost nine million in 1985, now has almost the same number of inhabitants as in 1945 after World war II. And, of course, the decline continues. As well as shrinking the population is ageing. In 2001 16.8% of the population were over 65. Just 10 years later the equivalent figure had risen to 18.9%. Naturally this means the median population age is rising steadily. It is precisely part of my argument that this surge in median age over 40 has important consequences for saving and borrowing patterns at the aggregate level, patterns which have not yet been adequately measured and identified. Thus the macroeconomic dynamics of a country change. The impact of these changes has not yet been incorporated into the traditional models most analysts use in forecasting. Naturally the workforce itself is in rapid decline. 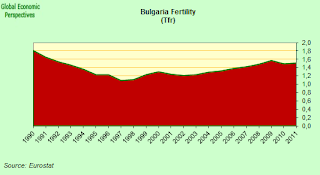 The causes of Bulgaria’s rapid ageing and shrinking population problem are twofold, low fertility and emigration. This is what makes the country look more like the old DDR and less like Japan. In fact Bulgaria’s situation is an extreme case of what is happening in many East European countries, especially Romania and the Baltics. If you want another reference point, Ukraine would be in this group, but even worse, since it is even outside the EU. Figures on declared emigration show an increase from 19 000 in 2009 to 27 700 in 2010. However, actual outflows are considered to be much greater, based on immigration statistics of th e main destination countries. Spain, the most important destination country in recent years, recorded 10 400 Bulgarians entering in 2010, 7% more than in 2009. Outflows of Bulgarian citizens from Spain also increased in 2010, to 7 600 from almost 5 000 in the previous year (+52%). The number of Bulgarians in Spain increased by 14 500 in 2010, and a further 13 000 in 2011. There are no consistent data for Greece, the second main destination of Bulgarian immigrants in recent years, but it seems that the stock increased less in 2010 than in previous years. Remittances data gathered by the World Bank give the general picture. Basically there was a large surge following the severe crisis of the late 1990s, and since that time the level of payments has only weakened slightly, on the back of the severity of the crisis in the main destination countries. Bulgaria is also pretty much what the old DDR would look like if it hadn’t fused with Western Germany, namely it much more similar to Hungary than it is to Japan (in the sense I discussed in this post) as it has a significant negative balance on the net international investment position (though not as large as Hungary’s), which means as well as being quite poor it is totally unprepared for rapid population ageing (since the text book way to sustain pension and health benefits in a context of increasingly weaker headling GDP growth is normally thought to be to draw down on overseas assets). Bulgaria also bears comparison with Hungary for the way it has carried out a rapid correction on its external position. This is due largely to remittances and services exports, since the goods balance is still in deficit. But still, the turnround is impressive. As elsewhere exports have performed very strongly. But again to no real avail, since domestic demand is deflating so strongly that the economy struggles to find air…… and growth. In this sense it is hard to agree with the IMF Executive Directors when they state in their latest Public Information Notice, following conclusion of the Fund’s 2012 Article IV consultation, they “broadly agreed that the currency board arrangement has served Bulgaria well”. If allowing a country to drift towards long term melt-down is doing well, I would hate to see what something which they thought was an impediment would do! Some thing is rotten in the state of Denmark, and that something isn’t being identified or dealt with. Naturally part of the problem is that the flow of credit has dried up. But the other part is surely the one Krugman identified in Japan, the growing shortage of Japanese (sorry, Bulgarians). It is hard to see how you can get serious retail sales growth in a population that is shrinking so rapidly. The end result is that the economy grew steadily into the global crisis, and subsequently has stagnated. This stagnation isn’t simply conjunctural anymore, it has become structural, as the decline in domestic demand associated with ongoing deleveraging and population ageing and shrinkage precisely offsets the positive impact of all that export growth. Not everyone is convinced, of course. The IMF expect the Bulgarian economy to return to a rate of growth of between 3% and 4% after 2014, but looking at the demographics and comparing it with what we are seeing elsewhere that seems pretty unrealistic. What is the expression Christine Lagarde would use? “Wishful thinking” perhaps? In any event, in the short term the country looks set to significantly underperform any such rosy expectations. FocusEconomics Consensus Forecast panellists expect the economy to expand 1.4% this year. In 2014, the panel expects economic growth to reach the impressive rate of 2.4%. Since Bulgaria is a small country, and a poor one to boot, most of the above had been going on virtually unnoticed by the rest of the world. 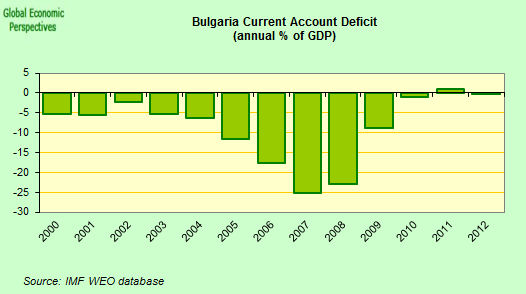 Then last week the Bulgarian government suddenly resigned en bloc. The immediate cause of the crisis which lead to the resignation was the continuing rise in energy costs, a rise which was largely blamed on the Czech provider CEZ. To appease the street protestors the government has now initiated a procedure to revoke the company’s licence, a move which has started to raise concerns about institutional protection in the country. Bulgaria’s State Financial Inspection Agency started a probe into CEZ’s Bulgarian units last year and submitted a report on Feb. 8, saying that CEZ ‘‘evaded requirements of the Law for Public Tenders,” the Energy and Economy Ministry in Sofia said on Feb. 18. The ministry asked the authority to conduct a similar investigation into the local units of Austria’s EVN AG and Prague-based Energo-Pro, it said. Bulgaria sold seven power distributors in 2005 to EON SE, CEZ and EVN before joining the European Union. EON sold its Bulgarian companies to Energo-Pro in 2011. Naturally energy prices are not the only issue. The population is tiring of austerity, and living standards that don’t rise even as unemployment does. 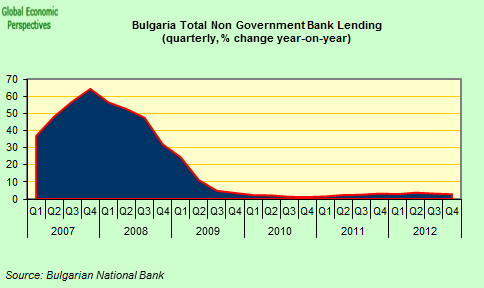 One symptom of this is that Bulgaria’s government sacked Finance Minister Simeon Djankov at the start of last week. Djankov was closely identified with austerity policies, and it isn’t hard to read his departure as an attempt to curry favour with voters in elections which are due this summer. Having said that, the country’s government debt at under 14% of GDP is incredibly low, so there is room for flexibility, if it wasn’t populist flexibility. The real issue is that simply spending more this year, or next, won’t fix the underlying problem, and that problem is unlikely to be addressed until it is recognized as a problem by the institutions responsible for economic policy formulation. As someone once said, de-nile is not only a river in Egypt. This post first appeared on my Roubini Global Economonitor Blog “Don’t Shoot The Messenger“. According to wikipedia: “There’s a Hole in My Bucket” (or “…in the Bucket”) is a children’s song, along the same lines as “Found a Peanut”. The song is based on a dialogue about a leaky bucket between two characters, called Henry and Liza. The song describes a deadlock situation: Henry has got a leaky bucket, and Liza tells him to repair it. But to fix the leaky bucket, he needs straw. To cut the straw, he needs a knife. To sharpen the knife, he needs to wet the sharpening stone. To wet the stone, he needs water. However, when Henry asks how to get the water, Liza’s answer is “in a bucket”. It is implied that only one bucket is available — the leaky one, which, if it could carry water, would not need repairing in the first place. The origin of this song seems to go back, oddly enough, to the German collection of songs known as the Bergliederbüchlein. Ironically Henry’s Q&A with Liza fits the quandry facing the countries on Europe’s periphery and their lack of constructive dialogue with their core peers about the roots of their problems to a tee. This entry was posted in A Fistful Of Euros, Economics, Economics and demography, Economics: Country briefings by Edward Hugh. Bookmark the permalink. How much of Bulgaria’s decline in population has to with the exodus of ethnic Turks? If I remember correctly there were periods in the 80’s when they came under serious pressure to emigrate. A second point. You’re concerned about population and how that affects GDP without any reference to per capita gdp. You could also look at GDP per worker or hour worked. If my memory is correct people who’ve done so in regard to Japan have made the point that Japan has actually done better than we thought. 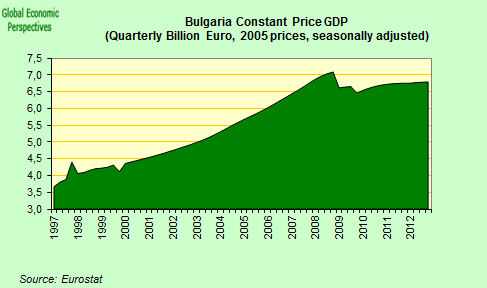 If Bulgaria is able to grow per capita GDP that should cushion the demographic shock. Of course this means a high growth rate per worker/hour worked. Which may be possible if there is room for improvement in human capital. Which are the EU-nations you expect to step up and generously foot the bill for Latvia-Bulgaia’s pension shortfall? The post almost sounds like you are bitter about youth moving to better pastures? I don’t fault your description of the problem but I don’t like your solutions nor tone. Yep, you are right, in the 1990s there was a surge of ethnic Turks leaving, post the fall of the Berlin Wall. That is why I focus on after 2000, which is largely ethnic Bulgarian, even Pomacs (in the early years of this century I did some research in Spain on the phenomenon of Bulgarian migration). And no, you are also right, I don’t mention GDP per capita. This is because, when it comes to growth rates I am simply making contrasts with what official organisations like the Bulgarian government, the IMF, the OECD and the World Bank say. 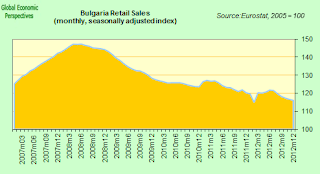 They have all been hopelessly over optimistic about growth in Bulgaria. Once we agree that this is the case, then we can start to look for why they may have been mistaken and the models may be inadequate. So I think this is an argument which goes in steps. Once we all accept that with ageing and declining population growth prospects reduce steadily, and eventually turn negative, then a new debate begins about GDP per capita. Perhaps you accept the first point, and then worry about the second. Then I suggest you take a look at the piece I did on Japan with Claus Vistesen – Japan’s Looming Singularity – and then the comparison I did with Hungary and Japan. I think the point the GDP per capita people miss – I mean it is OBVIOUS that as populations shrink the rate of change in GDP per capita improves – is that the age structure is changing. So even as GDP per capita doesn’t go down as fast as GDP does, GDP per worker may not be sufficient to provide pensions and health care to the growing elderly population. This is why it is very important to study what is happening in Japan. As to what is possible, all things are possible. Keynes may even have been wrong and we all get to live foreever. What we need is some sort of empirical evidence to back our hopes about possibilities. At the moment most of the countries in Eastern and Southern Europe are sinking into the demographic mire – for example the vast majority of CEE economies did not bounce back after the global crisis (in the way Turkey and other EMs have). The reasons for this lack of real recovery need to be identified and analysed. Well, it isn’t just Latvia and Bulgaria, Rahul, it is Latvia, Estonia, Lithuania, Hungary Romania, Bulgaria, Croatia (from next year), Greece, Italy, Spain, and Portugal. Basically all I am doing is extending the “Euro doesn’t have a common Treasury” argument to suggest that even without a common currency, in the epoch of ageing and declining populations having labour market mobility means having a common health and pensions system, otherwise the whole thing doesn’t work (countries eventually melt down) in the same way the Euro didn’t work till Mario Draghi said he would do whatever it takes, including buying up the debt. In the US, people in California don’t gripe about paying for people in Alabama, or Florida. Either we go down the US road, or the EU won’t work. That is the conclusion I came to when I was in Riga. I’m sorry if you don’t like my tone. I agree with your assessment about potential meltdowns. The longer list of nations leaves out only the few western EU members to chip into the pension kitty (on net). You think they can sell this move to their electorate? Agreed it was a past mistake but are the better EU nations willing to throw more good money after bad? The blind-spot in your solutions is immigration. To me Bulgaria et al. should be looking to expand their young taxable base and the answer probably lies outside the EU. “I somehow felt you were faulting the young for migrating to better pastures”. Not at all, and I regret it if I give that impression. In fact I think the opposite, that the young in many of these countries have no alternative BUT to leave. Especially as the taxable base declines and the number of people who need supporting (but are a voting lobby which is much more important than the young, who are often criticised for having been brought up “soft”, and to expect an easy life) grows and grows. I think I say somewhere that patriotism has its limits, and this is what I was getting at. You may love your country, but you may have no alternative but to leave it. A generation of Italians now knows what this feels like. Perhaps the reference to Depardieu was misleading. It was meant ironically. CNBC and Bloomberg have been full of comments about this form of tax exile, but there is little on the tax and ss contribution issue facing the declining numbers of young people, and of course taxing them more means even less domestic consumption, and more dependence on exports, etc etc. More holes in the bucket. I don’t know if all this has a solution. I would just like more agreement that it is a problem, then the debate about what to do can enter the real world, and not stay locked in the one of wishful thinking. No doubts about the effects of population shrinkage on long-term growth prospects. But with an unemployment rate of 12% and low public debts, I fail to see the link to the situation now. Agree with Vladimir on the need for a more precise argument too. As for Eastern Germany, I personally think the economic development there in the past 20 years is a very sad story. I’m pretty sure Merkel would agree but she needs this argument to spin her plot on Europe. But if the taxes are used to pay for benefits for the old guys, aggregate demand shouldn’t fall, should it? People in California don’t gripe about paying for people in Alabama. You need to spend more time reading the American press . I agree with your main point, that it is easier to end up in a place where people in California are paying for people in Alabama, but “don’t gripe” is definitely a bit of a stretch. “I personally think the economic development there in the past 20 years is a very sad story”. Well, this would be part of my point. Why should we expect the Spain’s, Greece’s and Portugal’s of this world to end up better. Population in all cases is now declining due to outward migration. “Agree with Vladimir on the need for a more precise argument too”. Well the thing is, I’m in a kind of double bind, since I am trying to pack in a lot of macro theory in a small space, and I’m not as deft with my footwork in the penalty box as Leo Messi is. On the other hand if I complicate things too much the basic points get lost. This all forms part of a piece with my recent Japan, Japan and Hungary, and Spain posts. The arguments all tie in together and weave a common cloth. The point is, taking the unemployment thing as an example, that economies can get stuck with high levels of unemployment and declining domestic demand. West Germany was like this before 2005. Unless the export sector is large enough to compensate for the decline in domestic demand you can have 20% unemployment, population decline, and GDP decline. This is where I am going. The key thing is to get the export sector large enough – Japan’s isn’t – to be able to get GDP to move. This means “competitiveness”, and it could mean, as in Japan’s case, currency wars. 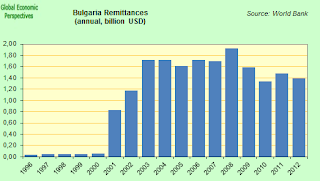 Bulgaria, like Hungary, is in no position to start a currency war, since it has a substantial net negative international investment position, and much of the PRIVATE debt (102% of GDP’s worth of it) is in foreign currency. In passing I mention in the piece that Bulgaria has a currency peg with the Euro, so policy is to a considerable extent designed to protect the peg, which means the side effect that much needed people leave is regarded as acceptable. Well, this could all go on and on. I said it was complex. All I can suggest is you read around my pieces. Again, all this is more complex. Modern economies at or around full employment don’t grow when people spend from current income (simplifying a bit, they are you could say “ticking over”), they grow when either you sell to external demand (exports) or when people borrow demand from the future on credit. In either of these two cases you can get ongoing surges in demand that feed growth. Now as populations age people borrow less on aggregate. So domestic demand lossed momentum, hence you need to move over to exports. Naturally if you tax young people and make gifts to old people with the proceeds you can support demand, my point is just how long will the young people put up with this? There are limits to solidarity, both within countries and between generations. Since the young have little voting force to change things, they end up leaving. That is, if you like, a negative feedback mechanism. 1. I think Bloomberg is a very bad news source, for what is going on in Europe. I like their data, and I hate their constant false propaganda, especially when they hide behind “The editors”. 2. Quite a number of Eastern German cities are flourishing. E.g. my Dresden has to built new kindergardens and schools at a very rapid pace. Their are now some kindergardens in Container agglomerates, until the new buildings are finished. Since even Switzerland has to run a official currency peg to the Euro /Deutschmark, I find worrying about Bulgaria, Denmark doing the same a little strange. Turning around Eastern Germany was extremely expensive (cumulative 100% western GDP), because they are German citizens, and had full rights to pretty generous Western Germany Social rights. I had so many discussions about, how that could have been done cheaper, and that all went to naught, thinking not only economical, but also political, law, human rights. And I do care a lot about sums of 100% GDP. via which I came here. A flaw in the rules of democracy makes this situation worse: children don’t have voting rights. So even with a perfectly regular demographic pyramid without baby-booms politics would still on average support policies benefiting the older participants of a democratic society. This could be fixed by giving parents extra votes. I live in the Netherlands and our situation is a perfect example of this mechanism. The crisis is starting to bite and every time spending cuts or taxes aimed at seniors are proposed this creates a huge media row. This is embarrassing because the older generation (50+) is by far the most wealthy part of the population. So in reaction to this a ‘fringe’ political party aptly named “50PLUS” has skyrocketed from 2% of the vote (last summers elections) to 11%. This while all the ‘normal’ parties consistently vote in favor of the seniors’ interests. Given the Netherlands’ demographic profile the 50PLUS party can get 50+% of the vote, no kidding. A clear democratic deficiency: tyranny of the masses. When there is one voting block with 50+% of the votes the others have no option of winning. Regarding migration. There is no need for a political union for this to occur. A country can just allow people with the needed skills in. Countries like Singapore, Australia, New Zealand, Canada, USA, etc. are doing this as we speak. So why should Germany funnel money back to the Baltics but not to Russia when people from those countries choose to work in Germany? History is littered with migration streams where the movers didn’t ‘compensate’ those staying behind. From an economic standpoint it makes even less sense to give money to the elderly instead of the children. It seems to only stimulate the demographic situation you are trying to avoid: more old people less young people. Maybe not a very politically correct observation but I think very relevant from a system standpoint. I think the concept of having a 20 year ‘holiday’ after your working life will soon prove to be unmaintainable with the boomer generation retiring. The fact that it ‘worked’ so long was due to the fact the second world war wiped out a lot of (to be) old folks. So the last 65 years there was an artificially low proportion of pensioners (due to WWII) that could relatively easily be supported by the broad base of boomers. Speaking about the migration of Bulgarian Turks and Pomaks at the end of Communism in Bulgaria, more than 300 thousand Bulgarian Muslims did emigrate to Turkey in 1988-1989. This mass movement did create serious labour shortages, especially in tobacco-producing areas where Turks and Pomaks formed a large share of the labour force, the resultant economic crisis helping to trigger the shift fro Communism. Since then, it’s my understanding that incentives for Muslim migration from Bulgaria have diminished–in democratic Bulgaria, the government no longer arranges pogroms against its ethnic minorities. the ageing of our populations. Even the CIA World Factbook provides ample pictures and numbers for that. The US fought a bloody civil war. I don’t think the neo-liberal war occuring in the EU will unite Europe, it may well destroy it. Think about what you just said here. Possibly you didn’t mean it as starkly as it comes over. How can you oppose measuring a phenomenon which is vital to the future of our continent. Ageing is understood and studied when it comes to birth rates and life expectancy (although precious little action is taken to do anything, we are just fatalistic I suppose). But it is not the case that any importance is given to measuring migrant flows of EU nationals either between states, or out of the EU altogether. Spain, where I live, would be a good example. We have a very good system – electronically updated – for measuring non Spanish nationals resident in Spain via the Padrón municipal where you need to register (irregular migrants included) in order to have access to health care. But there is no systematic attempt to measure the number of young Spaniards who are packing their bags and leaving, although everyone knows anecdotally that the flows are large and growing. People just hope one day they are coming back, but that is becoming increasingly unlikely with every passing day. No serious study suggests that Spain’s unemployment will fall below 20% before 2020. The only data we have are people who register to vote when there are elections. But young people are precisely the most politically disenchanted, the group who vote less. This situation is repeated in country after country. Normally we only know of the presence of communities via data from the new host country – Latvians in Ireland, Romanians in Spain. Domestically politicians have no interest in such studies, since they feel they will get the blame, or like the Portuguese Prime Minister Pedro Passos Coelho, in an unfortunate slip, they feel that young educated people leaving is a solution to the unemployment problem. It is, as the Spanish say “pan para hoy y hambre para mañana” (bread today and hunger tomorrow). Children are an investment in the future of a society, those societies who don’t have sufficient children, or wish their children well as they leave, suffer a resource allocation problem. They are effectively living now to pay later. 20 or 30 years from now we can be facing serious meltdown problems in one country after another on Europe’s periphery. Country’s can simply hit critical points and then become unsustainable. Not sure Keynes meant his famous phrase in the sense of “not to worry, in the long run we are all dead”. In some situations measurement is not the big stumbling block in the pursuit of a solution and this is a good example (I think). I agree with Genauer somewhat: Assume for a moment that you (miraculously) knew precisely all about the internal immigrant flows within the EU. What then? Are you any closer to a solution? Action is lagging far behind the current state of measurement. And it isn’t lack of measurement that is handicapping action. 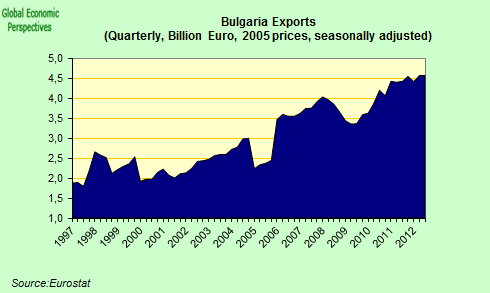 Even with what little we know right now (net flows out of Bulgaria, say) are we in a position to do anything about it? Proposing, discussing and getting consensus on solutions seems key. Measurement is always great, but I don’t see that as the most critical part of this particular crisis. We know enough, but don’t know / want to do anything about it. I’ll add to my previous post that the well oiled Brussels machine seems particularly adept in raking out voluminous scholarly studies that then no one acts upon at all. Perhaps that’s a facet of what Genauer was referring to. Yet another institutional exercise. I agree. Most people in America don’t think about intra-state wealth transfers at all, and there is very little general understanding of the economic differences between states. Americans complain about their taxes paying for welfare mothers or “government waste” but not about subsidizing poorer states. My tone was a little stark, I am just against installing new institutions. We have too many of the old dead shells here around, a miners insurance (Knappschaft) without miners, an association of war injured (VdK), with 99.9% of them dead by now. And all these busybodies then try to find new legitimization for their continued existence. I didnt want to give the impression, that I am against measuring, to the contrary. and references there. What is missing in your opinion? Germany being even a little older. Common institutions like unemployment, retirement insurances are the consequences of common government, and I see no mood for that anywhere here in Europe. Thanks, this explains to me the logic of your posts, that I didn’t understand until now. I also (as a non economist) believe this. However, it seems to me that, if we think to the world as a whole, since total world exports=total world imports, all growth depends on a constant increase in overall debt levels(!). This is ok from my more or less marxist position of “capitalism is an umbalanced system that can only grow through a constant increase of fictitious capital”, but it is the first time I find an economist that says so. Whether a company should be in private hands or various versions of public ownership, can also change over time. Rail, Mail, Utilities, the pension system are in public hands in most countries, but were starting originally private, and we again experiment with going private. A general thought is, if it is a (natural) monopoly, have public ownership, despite the well known disadvantage of nepotism. Long term stability depends on somewhat constant fractions of debt and parameters, like income distribution, and this can be done, as it is most of the times. A few years ago it was all the rage to sell them in various Germans towns to some “public/private cross border holdings” getting some initial payout with this, allegedly because of some tax benefits american holders could get out of that, and with huge and complicated contracts. I told my father, dont do this, there are troubles with this in latin america, with dead people. So he drummed up the resistance, petitions, and the deal got canceled. Nowadays some german towns are in some very predictable bitter court fights, which harm everybody involved. Here much of the housing was owned by the City, back from the socialist times. Relatively cheap rents, and it made losses. The other 80% effectively subsidizing the 20% in there. in 2006 the Woba, without about 60 000 units or ca 20% of the whole market was sold to the Gagfah, which is effectively owned by the US Hedge fund Fortress (ticker: FIG). A social charta and rent limits drawn up, and for a cool 1 billion. Dresden is completely debt free. And just a few years later, they checked with how much violation of the charta they could get aways with. Sued by Dresden over the full 1 b, counter suit, settled. FIG tried to sell, but with the recent drop in interest rates it looks very attractive to them again. 20% of the market is a huge chunk, but it is by far not a monopoly. And it is clear that this is settled 100% in German courts, between formally German entities. I think it was a good deal for the majority of folks in Dresden. Soo, applying that to the CEZ / Bulgaria situation, I am not taking sides but say, they both should not have done the deal to begin with. It is also not the only example for nationalist tempers flying in the Balkans. I also remember when somebody called it an “evil german hegemonial conspiracy”, what then turned out to be EU bureaucrats demanding from Romanian politicians that they show receipts an evidence for EU subsidies, just like the other 26 EU countries. Given all that, just completely forget about any pan-Euro insurance schemes for the foreseeable future. This would just drum up incredible moral hazards and endless resentiments, because everybody would feel short-changed. This is, how Europe is, including my Germany. I agree with you, I don’t think that I would like socialism now now now. But still this doesn’t mean that capitalism as we know it can find a new equilibrium as is usually presumed. In particular if my understanding of Hugh’s model is correct it implies a constant increase of debt levels, that means growing inequality and wages that don’t keep pace with debts; the policies that Hugh often advocates (like higher labour flexibility ) tend to increase this effect (for example if you lower pensions younger workers have to set aside part of their wages for the future , usually by buying some form of private pension fund). This is exactly the opposite of Minsky, who thought that higer wages and automatic stabilizers were the key to avoid crises. So I don’t understand why Hugh endorses those policies, instead of, for example, ask for a “jubilee through inflation”. Maybe I say it here more explicitely, I do share the concern of Hugh, that we have a problem with the ageing, not unsurmountable, but something that we do not understand. A smaller fraction of people in the emplyoment age means higher taxes, and they are already high. On the other hand, from my perspective the nordics in the 90ties, and Germany in the 2000s put their societies on a path, which I think is sustainable. I support Hugh, that the southern states need more labor flexibility, like in the above countries. Most people see this only from the employee side, and forget, that the employer has also legitimate interests. Some time ago I talked with a spanish software developer, who complained bitterly, that while wages and other costs might be half in Spain, compared to the Silicon Valley, the risk is too high. I asked, why, on paper you have pretty much the same limited liability laws as here. Your llp goes insolvent and that is it, if some idea does not turn out that great. Yeah, on paper, but a judge can find you guilty for gross negligence, and then of course, here too he would be liable much more. And the point is just, that this can happen with some socialist judges in Spain very easily.Well, then the guy will not hire permanentely. We have a ton of this automatic stabilizers in Germany, but that only works, if the company is basically healthy, and not starting in a situation, where the only question is, how many folks have to go, or the complete company with them. after the unemployment benefits are cut to nordic/german levels. “jubilee through inflation”, a lot of people would like that, the south, UK, US, JP. You make the high debt go away in a way people dont see it that precise, and especially those, who hold it predominantly, more older, middleclass have not the slightest chance to do something against. Politically convenient. Would not hurt me very much. But it is just not, what we signed up to with the Euro, and once you get this train rolling …. it will ultimately cost more, but you dont get people up in arms about property and other taxes. “On the other hand, from my perspective the nordics in the 90ties, and Germany in the 2000s put their societies on a path, which I think is sustainable. then we have to admit that Germany (and, I suppose, the nordic countries) only look sustainable because they are net exporters. But obviously it’s not that everyone can be a net exporter at the same time; thus the logical consequence would be that Germany and the nordic countries would be the culprits in this story (dumping their growth problems on other countries), and Greece, Italy, Spain etc. would be the “good guys”. Please note that I don’t mean it in a moralist kind of way: in fact I can assure you that since 20 years to now here in Italy “flexibilizing” workers is all the rage, ditto for lowering pensions, and so on: the policies of the two countries, for what I can understand, were quite similar in the last decade in reality. Most countries tried to export more than they imported, but since this is a zero-sum game someone could do it, someone else became a net importer unwillingly. Unemployment benefits for Italy, Spain and Germany seem more or less the same relative to the worker’s former wage. figure 2: both Spain and Italy have more small businesses per capita than USA or Germany. In facts, this is probably the real reason that Italy and Spain have bad economies, since small businesses usually work in low added value sectors. Actually, we signed up for a policy of currency stabilization, however deflation also should be fought against in terms of currency stabilization, yet you ask explicitly for deflation in in debtor countries (“I think a lot of the unemployed in Spain will find new work at lower wages”) but think that a policy of inflation would be against the pacts. One can only hope that after the current turbulent and hopefully purifying changes the situation will get better as life conditions and everything related. It is true that Germany was from at least 1953 on a permanent “net exporter”, actually often “world champion”, but the cumulative Current Account (CA) net position was in just 0.4% of GDP in 1998! How can that be? Because he had to pay war debt (last tranche on 3rd Oct 2010 1), to Israel, and while we exported lots of warez, we also spend practically everything on stuff like vacations in the southern European countries, then Asian islands …. Please look up the net positions for the Nordics as well, Finland 13%, Sweden minus 7%. One important caveat however: some things in these statistics don’t add up, at least for the US. This is the famous “dark matter” problem. Some of that is understood, but not completely. In the real world, most stuff becomes less valuable over time, either it degrades, like Maccaroni, or the new production becomes cheaper, and (nearly) nobody gives you anything for an old iPhone from 4 years ago. The last time people tried some overinvest was Japan around 1990, and people got so scared, uuugh, will all their robots they will outcompete us. Baaah, a giant waste of investment money. The recent German CA surplus is to a large degree with China, investment goods, luxury cars, at least for their standards, and that is only the very last few years. And that will not go on forever. For the unemployment benefits, the graph looks pretty similar. One question, at what wage level is this capped, and how low do you get these levels? Because I think, this is where it really kicks in. In Germany you go to social minimum, after 1 year. There are some additional details, which would take a lot of explaining. The IFC / MSME link from you , interesting, I will take a closer look, and not make a cheap shot here. This was one of the things, we realized here in Germany to be lacking, and encouraged entrepreneurship here (Ich AG, Gründerzuschuss, a lot more) since the early 2000s. In Germany we had about 1.5% inflation in the 2000s, despite many wages not growing at this pace. Now we will go beyond that, somewhat, for a while. And the target to have a Euro average of 2.0%, or a little tad lower, we should definitely keep. and whether that is understandable, maybe even agreeable, to you? One thing, I really like with you, we exchange data, links, views, not this brow beating as this happens so often. For me it is clear, that we can not just wash our hands with the 25% unemployment in Spain, but with the aggressive demands from Greece we got really wary here around to make any commitments beyond the existing treaty obligations. And Guindos and the bad mortgages in Spain do not instill the feeling that people are talking honestly with each other. “However, it seems to me that, if we think to the world as a whole, since total world exports=total world imports, all growth depends on a constant increase in overall debt levels(!). This is ok from my more or less marxist position of “capitalism is an umbalanced system that can only grow through a constant increase of fictitious capital”, but it is the first time I find an economist that says so. For one thing, that if an increase of debt means the economy grows, the debt level can stay the same or decrease. IE debt as a percentage of gdp, in this case world gdp, will decrease when the economy grows. 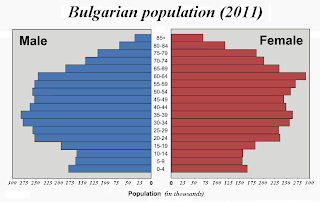 Irelands experience (which is the complete opposite) of Bulgaria shows your views on population and age structure with regard to its growth prospects is incorrect. Even now Irelands population continues to rise chiefly as a result of workers who came here over the last 10 ~ years reaching their prime child bearing years which in the once modern world is 30 somethings.